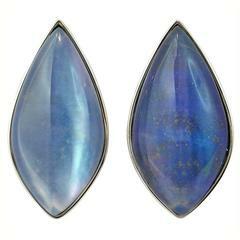 Jona design collection, hand crafted in Italy, 18 karat yellow gold stud earrings set with a crazy cut Quartz over Lapis Lazuli and Mother of Pearl, weighing 5.6 carats. Clips can be mounted upon request. Dimension: W 0.44 in / 11,19 mm X L 0.44 in X D 0.19 in/ 4,90 mm X H 0,19 mm All Jona jewelry is new and has never been previously owned or worn. Each item will arrive at your door beautifully gift wrapped in Jona boxes, put inside an elegant pouch or jewel box. This charming pair of stud earrings is entirely made in mother of pearl, shaped as stars and adorned in the center with cabochon rubies. The routing is in 18k yellow gold.